MomsRising.org put out a call for Halloween-- what's scary about being a mom? Lo and behold, did people ever have stories to share. 172 comments and counting-- people sharing their frustrations, worries, and bewilderment at the state of parenting in the United States today. It's amazing how quickly these stories were gathered-- everyone had something to say about how to wrestle a job's demands and a kid (or elderly parent!) while hoping for supportive family leave legislation. 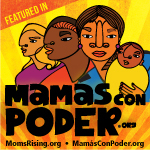 When MomsRising.org says "working to build a family-friendly America," we mean it. It's not empty rhetoric. It's so easy to see how sorely REAL action is needed, how empty words singing the praises of family while cutting back where families need it most (healthcare, family leave, flexible workplaces, affordable daycare) is so staggeringly wrong. Check out these stories, and please post your own (you can do it anonymously, or you can give permission to MomsRising to use your story-- you may even get a call from a reporter wanting to hear more about your story!). We're parents and we are not alone-- 82% of American women become moms before age 44. It's time to get organized, and this is how we're going to do it.